Need a new 36 volt battery charger for your club car golf cart? Look no further – This Lester 36 volt 21 amp Club Car Golf Cart battery charger is the best value for your money. Especially when combined with BatteryPete’s free freight policies. Lester Electric designs and builds the best darn chargers for your golf cart. This model is designed for ALL 36-volt golf carts (Manufactured throughout the 1970’s, 80’s and early 90’s that have the grey SB50 Andreson style connector). (How to determine if your golf cart is 36 volts or 48 volts.) This is one heavy-duty Industrial grade 36 volt battery charger. 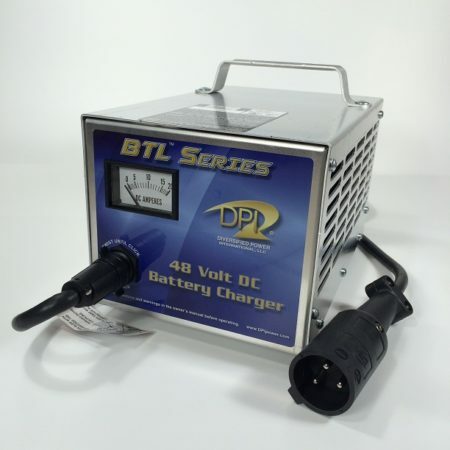 This Links Series 36 volt golf cart battery charger can not only charge your golf cart batteries it will exercise them will you are away on extended trips away from home. So you really can plug it in and forget about it. Peace of mind goes a long one if your are like most avid golfers with their golf carts. Batteries are expensive these days and if you want to get the most out of your batteries cycle like you will want to have the all new Links series 36 volt golf cart battery charger in your garage. Basically this 36 volt golf cart charger can detect the exact voltage within your golf carts battery system and apply the proper amount of voltage and amperage when needed. (Why does my battery charger need to stay connected to my golf cart battery bank when not in use for extended periods of time?) Links Series Chargers were designed specifically for use with golf carts and utility vehicles. They are available with a wide variety of DC plugs, making this 48 volt battery charger compatible with most golf carts and utility vehicle models, including those from E-Z-GO, Club Car, Yamaha, and other leading vehicle manufacturers. Due to Lester Electrical’s unrivaled reputation for quality and reliability they are the main golf cart battery charger supplier to the leading golf car manufacturers. One of the many reasons that have made the company a trusted supplier for over 50 years. This 36 Volt Golf Cart Battery Charger is MADE IN AMERICA. For the Quick Chargers – on boards 50% – 10 volts on the portables. I needed a new Battery Charger for our family golf cart because the old one just didn’t charge the batteries anymore. So I started researching online and found BatteryPete. I called them first to make sure they had one in stock as we needed immediately. I talked to Pete himself , He was very helpful and knowledgeable. We got our Golf Cart charger two days later. I was very pleased – we love our new charger. It was a great price plus free shipping, great service and a great guy. It was actually so nice to talk to a person for a change, usually all these internet businesses are automated or from somewhere oversees. Not BatteryPete they are obviously very good at what they do. Yes I would tell a friend. I was talking to my neighbor the other day about their golf cart and found out they just purchased a new battery charger. Our golf cart battery charger had gone south as well and I needed to buy another. I searched online a bit and just felt overwhelmed with the options. But after talking to Julia and her experience with BatteryPete I decided to take a look. WOW! Is all I can say – I actually felt comfortable buying a $300 dollar charger because it made in the USA and Lester is apparently the best. Not only did I feel like I got a good deal compared to other Lester offers, Pete shipped it to my door for free.